Aziza is one of the most fascinating restaurants and restaurant stories in the country. There aren’t many Moroccan restaurants in the country period. There certainly are even fewer restaurants with daring chefs like the incomparable Mourad Lahlou bravely, often brilliantly re-designing Moroccan cuisine into a new global modern cuisine altogether, with a few influences from Morocco evident in most dishes. Some dishes may even have nothing to do with Morocco, but that doesn’t change the accomplishment created by the chef. Aziza is a thrill ride from the moment you set foot inside from the foggy, bustling stretch of Geary in the Richmond District, known more for dim sum restaurants and Russian bakeries. It is truly a transformative experience. Laulou is a fearless titan in his quest to bring Morocco’s cuisine to prominence, while evolving it into the modern culinary language. After growing up in Marrakesh, Laulou came to San Francisco at 20 years old to study economics. As exciting as supply and demand curves can be, they are nothing compared to the vibrant cooking of Morocco. His first restaurant, Kasbah, opened in 1996 north of San Francisco, then closed, and Aziza opened up in San Francisco in 2001. 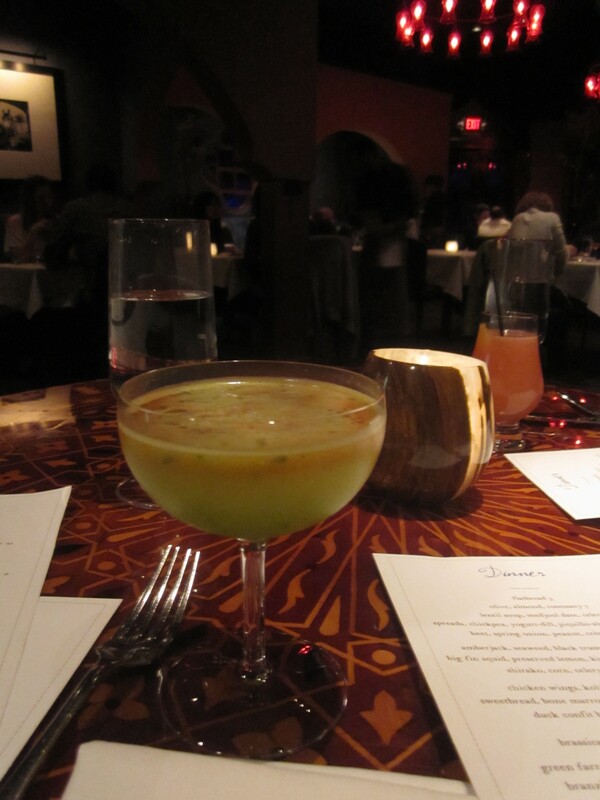 Aziza started as a slight tweak of traditional Moroccan cuisine. That tweak has become a gradual evolution over a decade to some of the most complex cooking on display in a town full of daring chefs. His recent cookbook Mourad: New Moroccan is a hit across the country, though not exactly full of recipes that are for home cooks any less complex than what you’ll find in an El Bulli cookbook. This is cooking full of spice, full of life, and full of personality. Moroccan traditional dishes do make an appearance. Nearly every tables commences with freshly baked flatbread to dip into a trio of spreads: a high caliber chickpea hummus, a refreshing yogurt-dill, and the best, a soulful brick colored piquillo pepper-almond. Couscous resides on the menu, though not in the traditional style with vegetables and their broth ladled on top, perhaps with some grilled merguez sausage too. I enjoyed Lahlou’s traditional couscous royale years ago with that merguez sausage. Now, the couscous comes with brassicas or artichokes and ramps. Tagine? Not here. There is the classic basteeya, evolved to be filled with duck confit instead of the traditional pigeon. Basteeya is a phyllo dough wrapped pigeon meat pie, dusted with cinnamon and sugar, for at its best a magical sweet-savory experience. At its worse, basteeya is a dessert gone haywire. 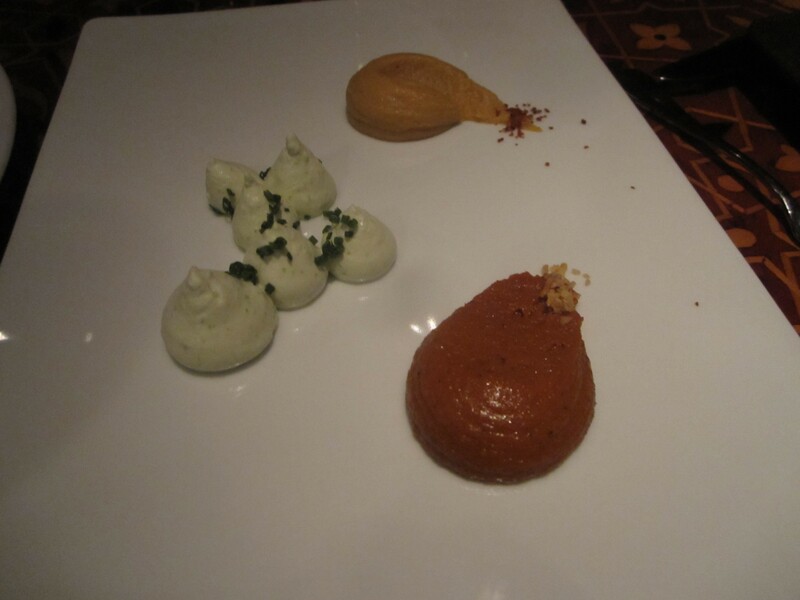 Not at Aziza, where the piping hot parcel balances both ends of the flavor spectrum perfectly. The one issue with ordering it with a small group is that the serving is large for an appetizer, and the basteeya very filling. At Aziza, sampling as many tastes as possible is paramount. You’ll find basteeya in Marrakech. I guarantee you won’t find the magnificent amberjack sashimi there. Lahlou loves de-constructed presentations. 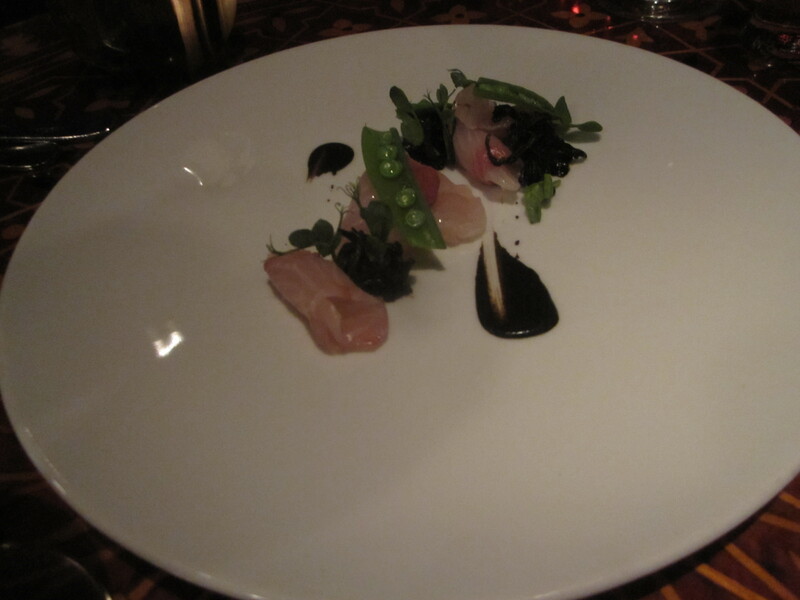 The amberjack presentation is abstract, de-constructed sushi featuring a quartet of thin slices of pristine white flesh next to minute beds of seaweed and the cutest halved snap peas with the peas themselves looking like water droplets on a green log. It’s a work of art visually and to the palate. This is the type of care and purity a leading sushi chef in Tokyo would serve for you after waking up at 4 am to buy the fish at Tsukiji Market. More creativity is on display everywhere in the menu where chicken wings comes with sunchokes and currants, and the Fergus Henderson fan club will cheer for sweetbreads AND bone marrow together with lily bulb, romaine, and scallions. With hit after hit for appetizers, main plates veer towards being slightly smaller than most main courses tend to be, allowing for more dishes to be ordered. Green farro arrives in a creamy risotto-like dish with slivers of scallop tossed about the farro, as opposed to the standard whole scallops on top of the farro. The shavings of Himalayan truffle and diced carrot are pure genius atop the dish for a rich, salty, crunchy element. 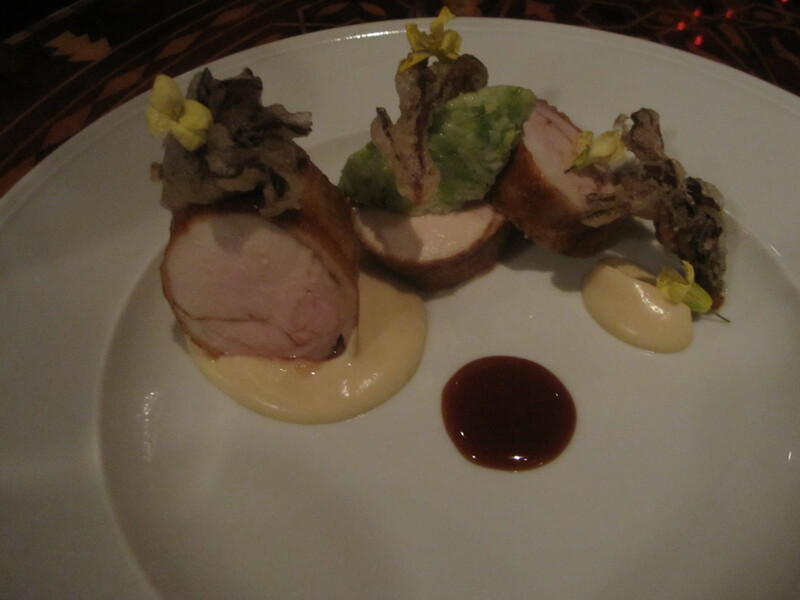 Chicken is as tender as a Peter Luger porterhouse, served in a roulade atop celery root puree. The green garlic, a real sign of spring, lacked any flavor unfortunately alongside the chicken, and the much hyped Hen of the Wood (appropriate for a chicken…) mushrooms were overwhelmed by their tempura batter. One classic always on the menu is the braised lamb shank over barley with prunes, a stick to your ribs preparation you wish you could have for every Sunday supper. No stone is left unturned at Aziza. The cocktails and the desserts follow the same complex prism. The bar program by Farnoush Delaymian is as riveting as Lahlou’s creations, with each cocktail focusing on an herb, spice, vegetable, or fruit. A rye selection with grapefruit, absinthe, and bitters ended up being far too heavy on the rye. I enjoyed but didn’t love the overly sweet wild arugula with tequila served up in a coupe, with a barely detectable turmeric root syrup. The tarragon cocktail with cachaca and cardamom pods and the riff on a margarita with almond and smoked salt foam both came highly recommended by the very helpful waiter. The only miss on advice from our server came with the highly anticipated desserts. Melissa Chou is the darling of San Francisco pastry chefs, recently named a finalist for the national James Beard Best Pastry Chef award. Like with many of Lahlou’s creations, her desserts blend Morocco with the entire world, served in various components that can be put together or enjoyed as separate pieces entirely. The problem in this case can be an occasional creation where the pieces are great, but not necessarily when combined. 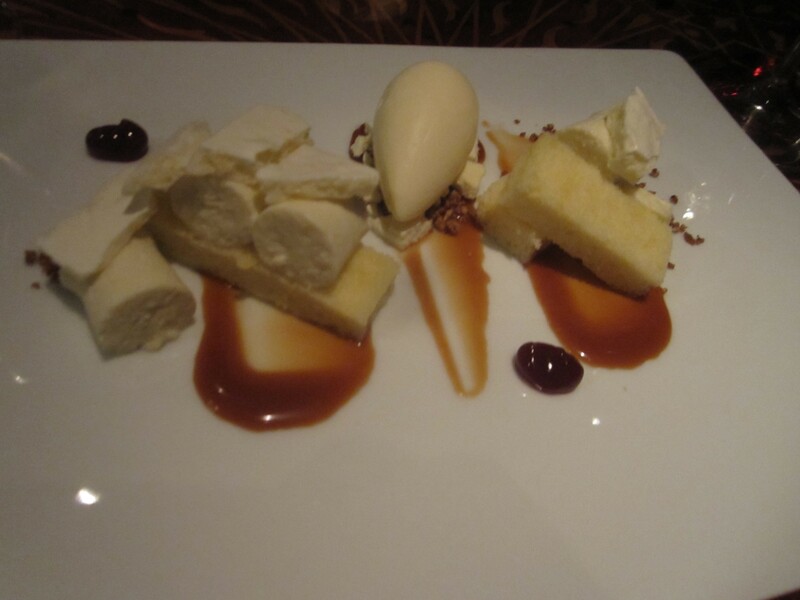 I appreciated Chou’s riff on a lemon pound cake, the usually dry, boring, ugly duckling of pastry chefs. Pound cake and fruit cake don’t move mountains like chocolate souffles. The small rectangles of pound cake serve as a platform for mini logs of lemon cream topped with icebergs of meringue, a clear take on lemon meringue pie. If the pound cake itself had a particular flavor, this could have potentially been special. The dots of blood orange, the quenelle of white chocolate ice cream, and thin pools of caramel sauce add some sweet and sour elements, but when elements are combined there is no unifying taste. The white on white presentation is a bit harsh to the eye too. The pound cake could use a flavor to liven the proceedings, but fortunately isn’t dry in the least. It’s a fine dessert, most likely not as stunning as lavender panna cotta with dates, rye, walnut cake, and malted vanilla ice cream, or the intriguing strawberry parfait with rhubarb, kumquats, pistachio, and my favorite dessert ingredient, beets in a sorbet. The Richmond isn’t exactly a real nightlife area, but with some of the most unique cocktails and desserts in the city, one could even have a casual dinner elsewhere and drop by Aziza for cocktails and guava sorbet with kiwi granita (the nearby Tommy’s Mexican Bar is renowned for its margaritas if you’re inclined to have a real cocktail crawl bonanza). That would be a shame though to miss Laulou’s cooking. It’s the delightful problem at Aziza, you’ll never be able to order everything that deserves to be. 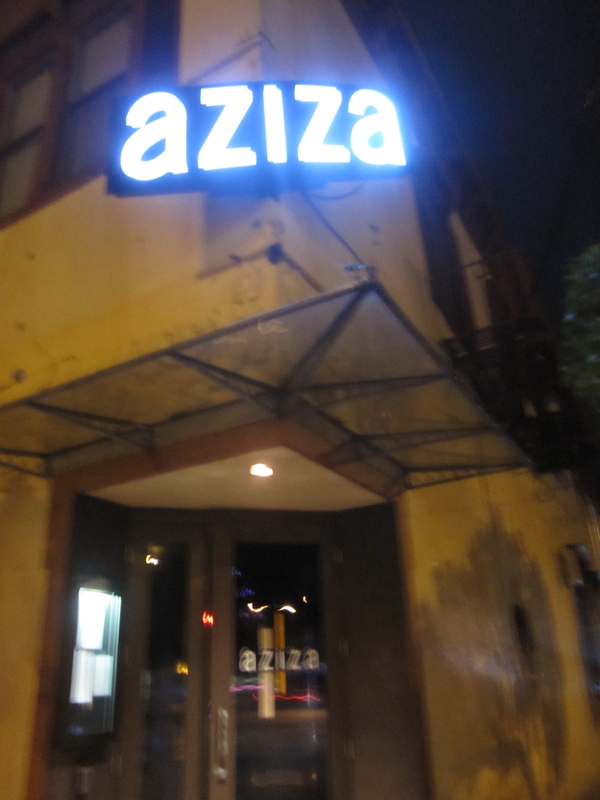 Many chefs soon will follow Aziza’s trail-blazing blue print. It’s a blue print for prosperity when the cuisine, cocktails, desserts, and atmosphere sweep you off your feet to Morocco and the mesmerizing world of Mourad Lahlou’s imagination. This entry was posted on April 19, 2012 by trevsbistro. It was filed under Restaurant Review, San Francisco .